Thiel, Peter; Masters, Blake (2014-09-16). Zero to One: Notes on Startups, or How to Build the Future. The Doubleday Religious Publishing Group. Kindle Edition. 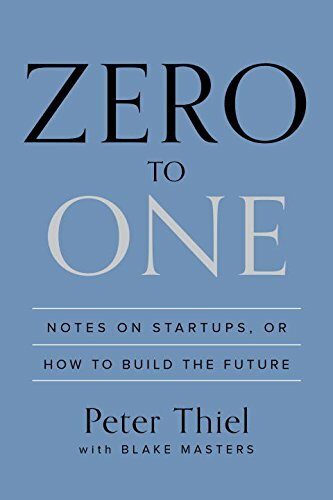 Last week I read Peter Thiel’s book “Zero to One: Notes on Startups, or How to Build the Future” (Amazon link). It was a surprisingly easy but very engaging read. It’s sometimes difficult to find inspiration in business books, but Thiel’s background and stories are clear, understandable, and inspiring (at least for me). Amy and I don’t have kids and neither of us are in school, but I am eternally fascinated by how the U.S. education system is evolving (or not, depending on your perspective), and how it impacts the U.S.’s ability to innovate. Thiel’s hypothesis that our education systems somewhat systematic production of “generalists” feeds our overall corporate and government cultures’ aversion to risk. Having a broad-based education is important to encourage and drive critical thinking, but I wonder if parents (and schools) encourage their students enough to pick one area they love and to go super deep in them, relative to all possible ‘broad’ areas. I also really enjoyed the depth of his analysis about the cleantech bubble, and how he used it to support his points about building scalable, defensible business that also have a chance to make a lasting, global impact. I think of them as robber barons…they have enough money to break all the rules. “One of the themes we’ve invested heavily behind is this intersection between big data and traditional enterprise application software,” says Ajay Agarwal of Bain Capital Ventures. Indeed, Bain’s newest partner, Enrique Salem, the former chief executive of Symantec, sees business technologies on the cusp of a still-greater transformation. A short but good summary from Ziv on how the relationship with potential candidates is changing because of BYOD.